Once again, my daughter has inspired a new treat – this time in snack form. She declared she wanted crunchy beans, which neither I or my husband could figure out what she meant. We had crunchy wasabi peas in the house, but I’m sure you can guess how much a 2 yr-old or 4 yr-old like these. What first came to mind was a recipe for Chickpea Kickers I had saved from Good Housekeeping eons ago (ok, from their May 2006 issue to be exact). While I still can’t wait to try it, the pan roasting method sounded like it would create a softer exterior than I wanted. I decided to lean on a recipe by Giada De Laurentiis and another one by Kim of Life in the Van for roasting tips to get that perfect crunch. Both indicated two important tips: (1) dry the beans after draining, and (2) roast for nearly an hour. The end result IS a crunchy bean that is just as satisfying as chips or other snack food with the added benefit of a good boost of protein. For an extra kick, I spiced things up with a chipotle flavored seasoning blend ( I can’t wait to try other blends!) 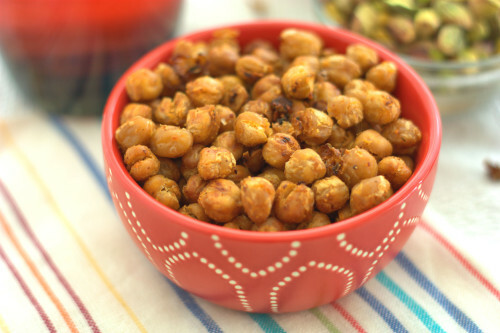 to create these Crunchy Chipotle Chickpeas. Preheat the oven to 375 °F and spray two baking sheets with non-stick spray. 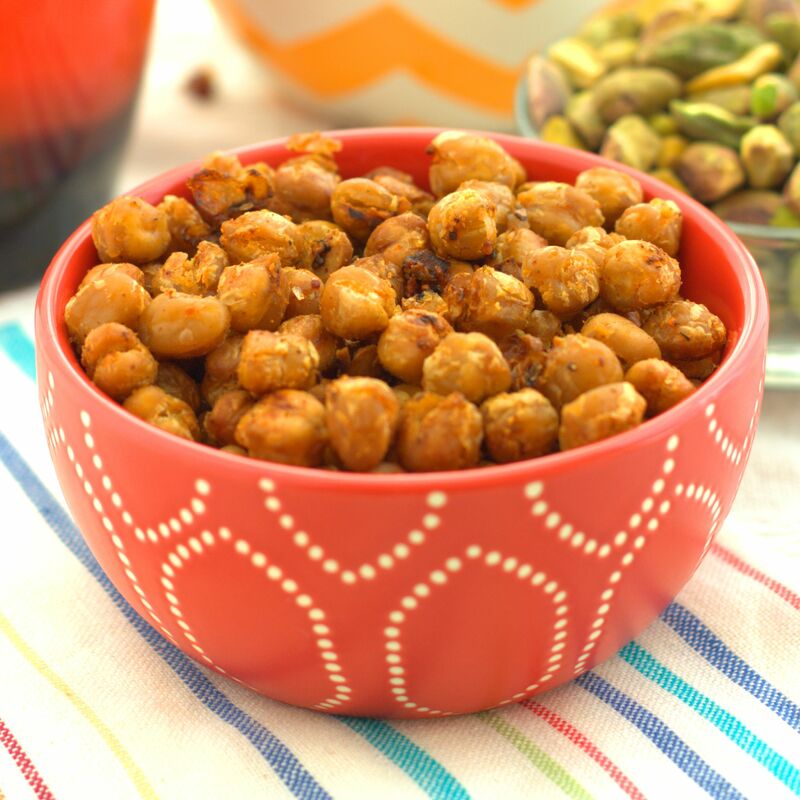 Pat the chickpeas dry with a towel, then place in a medium sized bowl and pour olive oil over chickpeas and stir to coat. 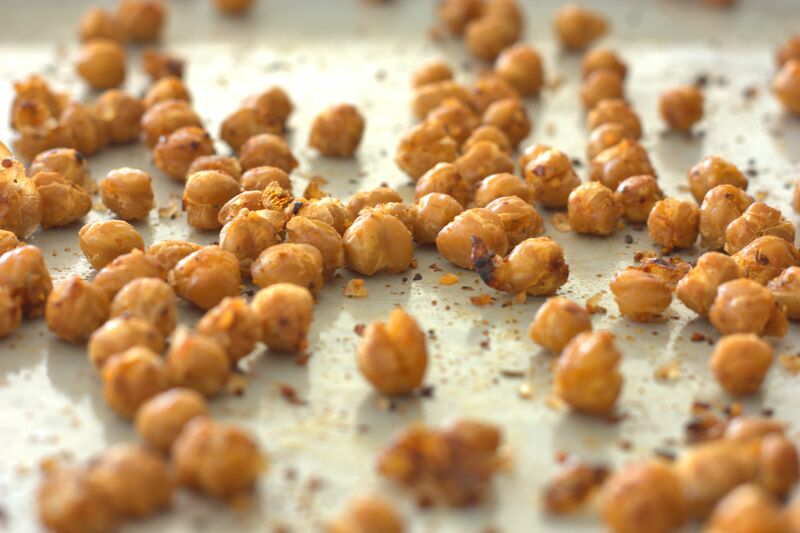 Sprinkle the seasoning blend and the sea salt over the chickpeas, stir to coat evenly, then spread evenly on the two baking sheets, spreading the chickpeas as much as possible. Bake for 20 minutes, then remove from the oven and stir, then return to the oven for another 20-30 minutes, or until the beans are turning brown and have a crispy exterior when tested. Remove from the oven and let cool, then serve. This entry was posted in Appetizer and tagged bean, kid-inspired. Love the chipotle on these little crunchies! Great recipe. Crunchy Chickpeas are SOOOO addicting!